Artist Cane returns to Artevistas Gallery this month with Just Some Artworks, a new solo exhibition delving into his unique, bizarre universe. 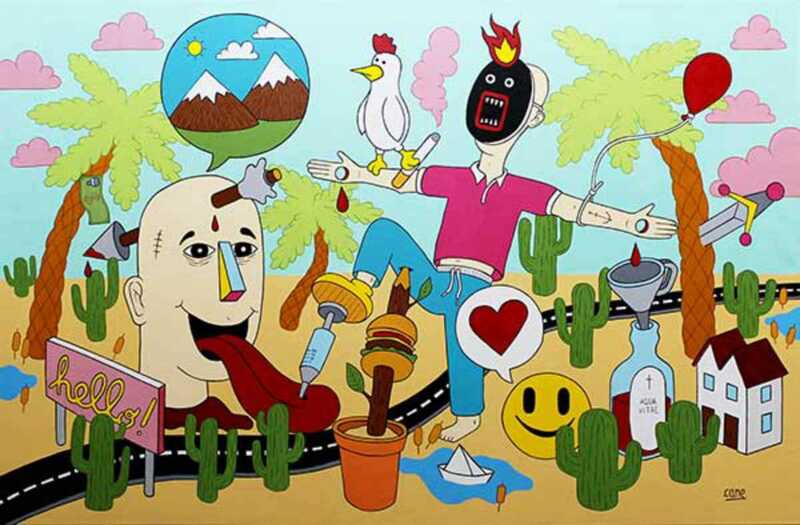 Part of art collective Frederik Garcia, this Italian illustrator combines pop art color, dark humor and cartoon violence in vivid surrealistic scenes, all set in a fantastical world where sea meets desert, cacti abound and aliens have been known to make an appearance. The culmination of a year-long exploration of themes and techniques, Cane’s latest works contrast Disney innocence with the darkly dreamlike qualities of a psychedelic drug trip: Postcard from Vietnam sees a man in Mickey Mouse shoes calmly clutching his severed hand; The Doubt shows a Cyclops preaching to a still-grinning decapitated man beneath candy pink clouds, and so on. Though united in form and tone, each piece tells its own story, and each can’t help but evoke a strong reaction – whether laughter, disgust, or something else entirely.